The week is coming to a close soon and what a week it has been. Unlike any other week I’ve ever had. Bedridden much of the time because of last Friday’s surgery. Durn, them folks almost split me in half now that I finally got a bird’s eye view of what they done did to me. No wonder I couldn’t do anything. Well, I’m progressing nicely and doing heavy duty jobs already like making coffee, (for myself), and cookin breakfast which has always been the one meal a day that I have cooked. Now when I talk breakfast I ain’t talkin about a little packet of instant oatmeal, no sir, I’m talkin bacon and hashbrowns, toast and eggs, maybe some sausage or a beef steak, and of course coffee. When I’m operating normally I need energy and this gives it to me. But there are some advantages to sitting around all day, day after day, a fella can read some stuff he normally would never get around to. The bed is full of livestock papers and magazines, two different Bibles, a cowboy cookbook, an old Methodist hymnal, and various other items that make one wonder about my personality a bit. Amazing how nowadays I can look over the Livestock paper out of Montana, look at cattle sales results and know some of the people who did the buying, know them personally. Seen one friend who A.I.s our heifers every summer was a high buyer out in far western North Dakota a couple of weeks ago. I always like working with him, just as I do with just about anyone who loves cattle like I do. He just lives a half an hour west of here. And in this downtime God is working on me mightily. The last few years I’ve I’ve been focusing on just doing what ever I could to help build the Kingdom of God, some successful, some not. But the fire was always there, pushing me on to do the Lord’s work. My focus has always had a farm and ranch base, always. Sometimes when I get real busy doing to much church work it would lose the focus so a couple of months ago I put in my notice to quit Children’s Church which I taught every Wednesday evening for five years with the plan of being able to spend more time working on farm and ranch ministry. God must think a little different than I do because the moment I retired I ended up getting set back mightily with the gut problems that had been plaguing me since around Christmas. To make a long story short, here I am recovering from going under the knife last Friday. One of the most interesting things for me has been digging into some of the old time hymns. Now I know many folks only want “modern” music nowadays or else something different than many of the old one, but when yu get right down to it some of them old ones could literally shake you with the power of the Holy Ghost! Now I’m a cattleman, I like western music, I like some of the modern church songs too, but back around Christmas when the wife and I went to see the movie True Grit on a Monday evening I durn near shook with the way that movie was made. The Christian hymns in it were unreal and such a good movie to boot. This week I was self examining myself, you know, I like cowboy church and all of that, (I really do), but I wondered about myself, do I just want to go that direction. Well, I like that direction but the thoughts kept coming to me to have an old time hymn thrown in the every once in a while too. I mean if they could make one of the best westerns ever made and have them old hymns in there that literally added bunches to the movie why not farm and ranch ministry. I’m hoping to hit the road by later next week, when I should be feeling a little more up and up. I am looking forward to it allot. Looking forward to man hunting again! No greater game can be found. I figure a cowboy parson is like an old time marshal or bounty hunter, going after those that Jesus wants! Getting on the trail and not letting up. It does take grit allot of the time I can tell you. This is going out where you don’t see any nice church building. This is going out to those that are shunned by normal church folks live. Kinda going out to no man’s land in a way. That’s where I come alive! Can consider it the same as heading out to outlaw territory. I know it might sound a little funny, but in reality this is exactly what it is! So I’ll close tonight, don’t want to over do it and had better go and lay back down for a bit. Getting ready for what God has called me to do, arming myself more and more as God knocks me down for a bit to get me straightened out! They’re talking like the warm spell is ending for now, which is no surprise in the north country. But now even the lows are forecasted higher than the highs were a few short weeks ago. Time is marching on, winter might still put up a mighty fight but it will lose sooner or later and spring will take hold. Today the water was running all over the place but by tomorrow the water will be solid like a rock again. That’s fine with me because its easier for the cattle when the temps are mild, but its still not warm enough to get sloppy everywhere. Yesterday we sold some calves and the prices were the highest we have ever gotten in this lifetime I tell you, through the roof! Was getting more for a calf than a fat steer would have brought a few years ago. I’m praising God for this! And without this being a brag, with all the hundreds of calves coming through the ring, ours again topped the market! Them calves looked good and boy, did they have snap! The ring man had to head for cover fast! Funny how when the calves are so actioned packed, so is the bidding! So another year of keeping the sales slips for family historical purposes. I keep all these mementos through the years, just as I think I still have every cattle and ranching magazine I have ever received. Quite a pile! Now with those calves sold, that’s behind a person and now that the dust is clearing in my head I gotta start looking ahead a bit for the new year. In my terms this is the start of the new year being that the old year’s production is now sold. There sometimes comes a time when a person looks around and sees that they are truly blessed. This was my afternoon today. In many ways it was kinda sad. Tomorrow I’m having an operation and I’ll be laid up a minimum of six weeks. I was finding extra work around the cattle just to be around them. I don’t know what I’d ever do if I couldn’t raise cattle. Just don’t know. Wanted to as a young man, and I held onto the dream for years and years. Then I bought my first 9 bred cows and I had a start. Through the years I saved every heifer that was worth saving and after a couple decades I’ve been in the top ten percent of beef producers in the United States. They’re a good herd, a reputation herd. I put allot of sweat into them, every day, year after year. I bought good bulls, I used A.I. to make my own top notch stock. Built miles of fence, built buildings and corrals. And now to have to step down for a few weeks is very hard for me. There might be a blessing in all of this though. I’m the kind that only wants to be outdoors working with the cattle or the crops that feed them. I am terrible with business planning and heading to town to deal on supplies. After a couple of weeks I might not be able to do any labor but I can be a bigshot! Probably a good time to get the records straight around here too. Who knows, I might pick up some good habits! I ain’t going to act like I’m some sort of a super person, no I ain’t. I find myself worrying here and there. I know its preached against. Some even say that its a sin, that we are supposed to have our faith so high that there is no such thing as worry. I’ll confess that I ain’t perfect cause I’m worrying a little bit. Sometimes there’s a thousand voices going through my head saying all sorts of things. Like recently, this week in fact when the doctors figured I had a good chance of having cancer, those voices were screaming in my head. But even as I worried I asked Jesus to take control. I said Lord I’m sorry for worrying but even with all this mess in my head I’m believing You! After the tests it was shown that I was all clear. I worry about this cattle operation when I’m down, but the Lord has given me ample help to make it through without much problem. Again, He took care of the worry that I had when I gave it to Him even with the thousand voices screaming in my head. Our heads will always have those worries popping up. The answer is in the Bible though. And it can set a person at ease. It can take away the guilt a person has when those worries pop up and we think that we’re not supposed to ever be worrying, that we are failing because we are worrying. God put these feelings in us to draw us closer to Him. If we never worried, or had us any troubles, well we’d start feeling that we don’t need God for anything. The Bible says that we are to believe with our heart! When we have that speck of faith in our heart that knows who Jesus is and we act on that little speck, that little spark, it will over ride that whirled up mind every time. When we call on the Name of Jesus with that little spark, well, Jesus moves! What a wonderful God we have! He doesn’t demand anything that we cannot do! When we start looking at Him for what He really is, instead of what man teaches us He is, we start to understand that no matter what we are going through He will see us through! Those worries in the head start to lose their volume, little by little till after a bit they are way in the back round. He shows us the good that will come out of what a person was previously worrying about. Yep, this outfits going to do alright! It’ll be better than before! I have faith in that! Here it is in the middle of February, haven’t written here in a while. But that can get changed tonight. God is Good all the time! The weather up here in the north country has been very pleasant this week with a melt starting and should continue for a couple more days. Was a bit worried if the truckers with the cattle trailers would be able to make it in this week to load calves but that went alright with the warm up coming about an hour after we loaded the calves for the salesbarn. Tomorrow its off to the barn and get em sold. Lookin to join the local cattleman’s association one of these days. I used to belong to the state and national groups but for some reason lost interest over the years, maybe because they were so remote. But I was reading in the local farm and ranch paper that the local that started up is doing pretty good and I figure why not! Don’t plan on getting deeply involved but wouldn’t mind seeing what they are up to. Mostly though my interests are just raising cows and spreading the Gospel. Who knows, might be some connections with the cattleman’s association that could further the spread of the Gospel, you just never know what God opens up. I’ve seen amazing things happen in the past when a person just has their spiritual eyes open. Lord, help my unbelief! This scripture is one that always hangs on to me. One of the top ten in my book. That desperation from a father that had no where else to turn. The drama that unfolded in the verses before and after the ones I posted is awesome to be sure. Now I don’t care who a person is, many times we think we are in control, but rest assured we are not. We can think we are all high and mighty but it only takes one little thing for all of that to come crashing down. Whether its a doctors report, an unexpected notification in the mail, an unexpected notification by the sheriff’s department of a family disaster or something along those line, we are not in control. Many folks think its in God’s plan for us to have these disasters, maybe, maybe not. The god of this world is exactly that, satan is running fairly free in this world to destroy everything we have and its only by the grace of God we are even breathing. But when satan hits us, which he will by the way, there’s a God that will see us through and we will come out in victory if we “only believe”. That father in the verses cried out to God with tears running down his face for help. And what did Jesus do? He went into immediate action! There was no fooling around having the father wait, there was no fooling around in order to teach the father to wait on the Lord, no, the action taken was immediate! Now I don’t know about anyone else but I do believe that this is how God works. Jesus said if we have seen Him we have seen the Father and if Jesus did it that way then this is the Father’s will, simple. We tend to complicate matters allot in religion and churches, making excuses for unanswered prayers. But my Bible says that Jesus cares for them, and heals them all! Now I’m a pretty simple guy, just out here where the northern plains meet the north woods and I keep my nose to the grindstone. My beliefs are simple, and even when I listen to Christian radio during haying season in the tractor I sometimes have to shut the radio off because of the shear unbelief being preached. 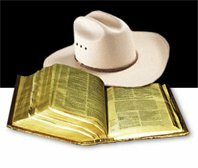 I’m just a cattleman preacher and I figure if the Bible says it, that’s the way it is. No need to complicate it, no need to make it into a ceremony, no, just believe it, have faith in the Word of God and I must say, things do happen when a person does. Situations change fast, healings do occur, what was once a problem is somehow solved. I’ll take the Jesus that’s in the Gospels any day! Now that’s someone to follow! He ain’t out to get a person like I read and read from many so called preachers. Nope, He gave it all on the Cross for everyone that looks to the Cross and to Jesus as their Saviour. Ever notice if your a Bible reader, and even if you only read a little of it or just had the Gospel stories told to you a long time ago how Jesus always helped out those misfits that were in need and the only time He ever got all angry was with the so called religious folks? My Jesus loves the down and out, He loves those that are struggling with terrible problems, those that have or are losing it all. Ever notice how He’d hang around the folks that in today’s world wouldn’t even be welcomed in a regular church. Ever notice how so many churches demand that one changes before your accepted into their little group. In other words religion demands that you change before God will accept you. That you have to clean up your act. I hate to say it, cause many folks will disagree with me but there ain’t one person on this earth that can clean up his or her act before coming to Christ, no, not one. And if you figure you did clean up good enough to come to Him my advice is to get on your knees and ask for forgiveness and ask to be born again because rest assured your not if you did it on your own power. Come to Jesus, because He’s the only one that can make you clean. Come as you are and let Him do the work. The salesbarn is one of my favorite places to go, which I will be doing tomorrow. When I see the hustle and bustle, when I see the day workers, the different farmers and ranchers, I see the Gospels exploding in front of my eyes! The regular folk, and Jesus took the Cross for each and every one of them, and me. God loves them, and so do I. This is farm and ranch ministry!